By the time you are done with this article, you will have a better idea of the best places to go and things to do around the province of Palermo. These are all of the must-sees outside of the city limit, which typically takes an entire day (or more) to visit. Buongiorno or Buonasera (depending on your time), it is old Don Tano here, your self-proclaimed tour guide to one of the greatest Italian cities. There is no doubt that Sicilians love to posture and preen, but it really is spectacular to see the island for yourself. Another spectacular thing is this guide, which is pretty long, I know. I promise that if you give it the 10 minutes or so to read the whole thing, you will know everything you can’t afford to miss out on when you visit. You will not regret spending the time, old Don Tano gives you his word and honor. Honor is what makes the Sicilian man. Or you can take it from someone who was neither wise nor a good person who said “With no honor and respect you are nothing mixed with nonexistence.” That was a well-known quote from a Sicilian Mafia boss of the bosses, Toto Riina. Hopefully we understand each other a little better now and you can have a seat and appreciate the 10 best places to see surrounding Palermo. If you have not seen it yet, you can find a video below here offering 20 vital tips from locals to first time visitors by myself and my friends Salvatore and Antonio. If you were starting to get a little sleepy with the video, slap yourself and snap out of it because I am going to give you two very important pointers to remember. Also, if you don’t like the video, don’t let Salvatore know…he’s pretty sensitive. Ok, here is what you need to know. You might be surprised (or maybe not) that Sicily is not a small islet that you can easily explore via Vespa, but it is an area of 25,426 square kilometers. It is bar none the largest Italian island, and the 3rd largest island in Europe. There is an array of beauty and cultural heritage that makes many visitors to the island want to move and spend the rest of their days here. But that sort of decision just is not practical. You can, of course, buy a Vespa scooter to comfort you and bring a piece of our famous Dolce Vita back to your own country with you. In the meantime, here is some advice when you tour around the island. Rely on Public Transportation – This is an excellent way to run late or even miss limited openings for sites you want to visit. Rent a Car – This is a good way to tour around and you do not have to contend with the horrible public transit system, but of course you have to know your way around a bit and get used to the anarchy of the roadway. Rely on Local Tours – This can sometimes be more expensive, but it is the best, safest and time efficient way to experience the island as you would like to. It is up to you to decide, but I hardly consider the first option to be a worthwhile option. Below you can find the 10 places you should visit outside of the city. Allora, I boiled down all of your options into the 10 best choices to keep you from getting overwhelmed. “Allora” is one of the most common words said in the Italian language. It means “so”. It is a filler word that many Italians use before they start a new phrase. Allora, do you want to know what the best day-trip itineraries are from outside the city? Let’s begin with the pastry, and you will soon know why. About roughly 25 km from Palermo you will find “La Piana”, which is a small mountain village. While I will get a little more into history in a moment, first you should appreciate why it is important to local Sicilians. It is believed that within this village, the best cannolo in the entire world gets made. One you are there, you can understand these words finally from Francis Coppola’s masterpiece The Godfather. If you do not know what cannolo is, go to a corner and face the wall. Once you have done this, you can take a look at the must-eat page on the site without licking the computer screen. Here you can find a description of this delicacy and many other foods you should try. Here’s a little something you should know about the history here. Up until around World War II, this area was known as Piana Dei Greci (translated as Greek’s Valley). Mainly, this was due to the professed Byzantine-Greek religious ritual. Today it is still heavily populated with Albanians and Greeks alike, boasting the largest of all of these types of colonies across Sicily. The area is a great example of ancient Albania in the modern era, and much of the history has been preserved with the people that continue to live here. Over the years it has surprisingly maintained much of the ethnic, linguistic, religious and overall cultural staples of Albania. Once you enjoy a few cannoli, you can take part in much of this history throughout the village if you are interested. You need to have at least one cannolo first though, or you have to put your nose in the corner again. Start with St. George’s (oldest church in the village), as it is loaded up with statues and paintings to see. After you do this, head to St. Demetrius, a Greek Rite church to see some of the impressive frescoes painted by Pietro Novelli. There is an anthropological museum nearby where you can see authentic Albanian costumes and other traditional items. 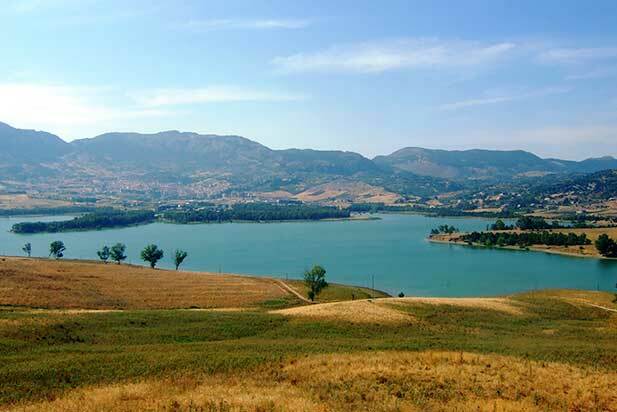 In the southern part of town, you can find the Piana degli Albanesi Lake. This artificial landscape feature was built back in 1923 and is the oldest in Sicily. Its construction was designed to produce electricity for irrigation purposes. Sure this is an interesting attraction, but you won’t end up in one of Dante’s circles in Hell if you happen to miss it. The same cannot be said, however, of forgoing the cannoli. If you have a rented car (which if you don’t you are at the mercy of so many elements), this is not one of the overnight trips. Round trip travel time from Palermo is only an hour and a half, and try to have some fun on the winding roads you travel here. The best way is through attending an organized tour with locals here called “The Streets of Mafia – Half Day Tour of Corleone and Piana degli Albanesi”. In about 4 hours, a tour guide will pick you up in your accommodation and take you to both Corleone and Piana degli Albanesi (with a much needed stop for cannoli). Bottom Line: This is the best place that you can find cannoli (a staple Sicilian dessert). It is worth a visit for this but there are many historical points of interest as well that you should not miss. It also is a nice stop along the trip to Corleone in the region. Don’t forget to grab a cannolo to eat on the way back. By the way, bite into it by opening your mouth wide. You should hear a crunchy sound that immediately makes you want to bite again. You will enter in a state of ecstasy that makes you keep biting until you need another cannolo. Really, this needs no introduction. Marlon Brando in the Godfather series said that he would “make you an offer you can’t refuse” but I intend to do the same thing. Don’t make a fuss and go to visit Corleone, Capisci? Want to know one of the features of Sicilian men of honor? They are very difficult to talk to. They speak their own language most of the time that is made of synthetic phrases and short, subtle expressions which congregate into longer speeches. You have to be a man of honor yourself or one smart individual to understand exactly what is being said. It is truly speaking a second language. Very interesting, but a little scary at times too. If you are into Mafia stuff, a town by the name of Corleone should bring up images of Don Vito Corleone of the Godfather, and should also definitely be on your list of things to do in Sicily. Just in case you forgot, there is a video below about some of the scenes from the Godfather that were shot in Corleone. I’m sure that you like the video that I did with Salvatore and Antonio about the insider tips for Palermo. Shhh, don’t let Francis Ford Coppola know that though, I think he is pretty touchy too. This will be our secret. The village itself has always been associated with Mafia dealings ( and rightfully so). Long before the film was ever a thought, some of the biggest and most powerful of the Mafia bosses came from Corleone. Oh, you want to know their names? Ok, in chronological order, then. Luciano Liggio, Totò Riina, and Bernardo Provenzano. These are among the most powerful and fierce bosses of all time, but also a great cancer for the Sicilian people. All I ask is a small favor: do not take a Mafia worshipping tour through Corleone, but rather take a tour to see the tragedies and damage the Mafia actually did to the Sicilian people. Start the trip at the Mafia museum, as this will give you look at the centuries past in a bloody retelling of the Mafia’s foothold in Sicily. Do not get swept away in idolization. This would be insulting to most Sicilians who revere and respect those that paid the ultimate price in fighting this wicked organization. Two great examples of this would be two judges, Falcone and Borsellino. 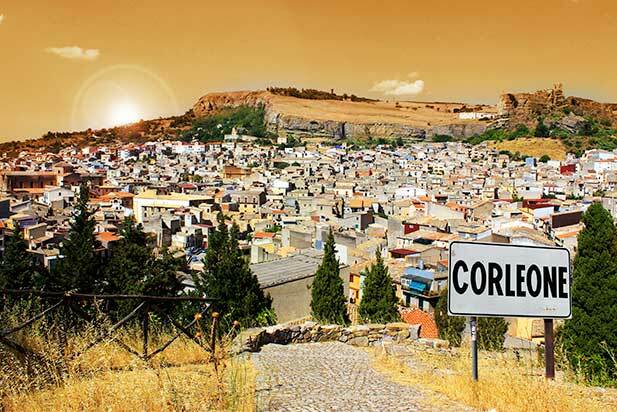 It might have a lot of Mafia history to see, but that is not the only reason why you should visit Corleone. Here you can see nature, archeology, tradition and history at its finest. It is all of these components that make Corleone a great stop on your trip. You see, it is not only about the Mafia. The village itself rises on the Ficuzza Wood which was an area originally created for hunting and agricultural experimentation through pooling large estates together. This dates back to the end of the 700s. There are plenty of great sites to see including a plethora of botanical beauty and many buildings that have been constructed within the woods (like the Palazzina Reale). Many tourists head to Corleone because of miracles that have been said to occur throughout the Tagliavia District. This is evident through the 19th century construction of a sanctuary, the Madonna del Rosario, dedicated to the Virgin Mary for miraculously healing animals stricken with an epidemic at that time. You really don’t have to spend a night here either. Round trip is only a couple of hours. You can head out in the morning from Palermo, and be back in Palermo before nightfall easily. Unless, of course, you have to tell your friends that you slept in the town that Don Vito Corleone was born in. Again I would urge you to consider “The Streets of Mafia – Half Day Tour of Corleone and Piana degli Albanesi” with transfer included. This is very popular and can sometimes be a challenge to find free spots. Bottom Line: If you have seen the Godfather series, this is a must-see for you. Besides, a visit to the Mafia Museum (Cidma) will give you a great picture of the bloody phenomenon and the stains this organization left upon the Sicilian people. I assure you the red wine is not blood, but they also have a white option as well. This is a family-run winery, founded between the late nineteenth and early twentieth centuries by the intuition of Giuseppe Pollara, the founder of the winery. It has about 100 acres stretched about northwest of Corleone. Leave the rifles, horse heads and cannoli behind and grab a history book. 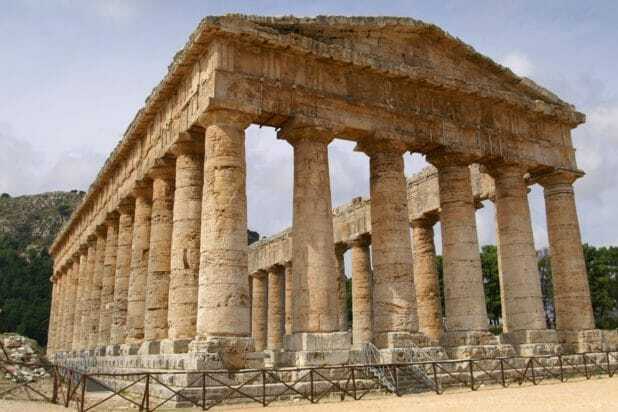 While it might not have a name as recognizable as Corleone, and it might not be the home (fictional or otherwise) of any mafia boss throughout the years, there is a lot to make Segesta world-renowned. If you are not all about historical tours and sites, you can skip this one entirely. Between me and you though, don’t tell people here that you do not care about it because they will think that you are no better than a donkey. I must admit, I was the same donkey myself before discovering these marvels at the ripe age of 30. But, that can be our little secret, too. This is a renowned location due to its Punic history (people from Carthage or modern day Tunisia). People from all over the world are drawn here for the Doric Temple and the Greek Theater. These were constructed back in the 5th century and remain a standing reminder of the area’s history and splendor. And guess what? It isn’t even boring. In fact, there is a lot of mystery surrounding this village. For starters, no one even knows (not even Don Tano) when it was founded. Due to some uncovered documentation, it was inhabited as early as 9th century BC. The document would describe how Trojan refugees crossed the Mediterranean and when they reached Sicily, founded Segesta (known as Aegasta at that time). Another theory suggests that it was founded by Acestes (son of the Trojan Egesta) and the God Crinisus. A final theory about the origins comes from the Roman poet Virgilio who believed that Segesta was founded by Aeneas and was a resting point for old men and women as they made their ship journey. Only being 70 km from Palermo, it is possible that you could make this a day trip if you had a rented car. Make sure you study Segesta before you go and take a travel book, otherwise you might not be able to make heads or tails of the town. You won’t be disappointed if you do the organized tour with the locals. They will take you not only to Segesta but also the Selinunte (see below) for a total of an 8 hour tour. Bottom line: The Doric Temple and Greek Theater alone draw in tourists from all over the world. These historical marvels are worth the visit. The only flaw is that you might want to brush up on some history before you arrive. The folks around here boast of making the best Cassatella with ricotta in all of Sicily. These are fried crescents of dough filled with sweet ricotta and chocolate and dusted with icing sugar. They are great indeed and you should eat a couple there and take a couple for the road. Don’t say anything to the folks from Castellammare del Golfo, though, as they think they make the best Cassatella in all of Sicily. This is yet another place where it can benefit you to open up a history book, but there is a lot less ground to cover. It has only been around for about 240 years. If the words “history books” scare you, feel free to skip ahead to the next location. Still here? Excellent. So, Selinunte is an ancient Greek city that once neighbored its rival Segesta. Being the westernmost Greek colony in Sicily, it doesn’t have a long history to speak about. The town experienced a great economic boom and a simultaneous period of decadence. It is home to the biggest archeological parks in all of Europe, and the entire town oozes history. The park is an amazing example of Greek culture in Sicily. As you can imagine, this draws in many tourists from all around the world. Have I already used the word “breathless”? I guess not, so I will now. Walking through the 250 hectares, you can see many of the white temple ruins with the blue sky as a contrasting backdrop that will literally leave you breathless. Most of the beauty that you experience in this town is in the ancient ruins, and there are more being discovered as years go by. On the Acropolis, 6 different temples were found, dedicated to Athena, Apollo, Castor and Pollux. The other 3 were located on the eastern hill. Earthquakes ruined some of the temples back in medieval times. Two famous temples, E (Hera) and C have both been meticulously reconstructed. You can travel back in time from staring off into these ruins. At one point, the area would have been full of temples wet with the salty airs of the sea. This was brought to me by a friend Tanino from Selinunte, who has been given the nickname “U Sciancatu” which in Sicilian language means crippled people who cannot walk well. Apparently for the last thirty years, Tanino has pretended to be lame to get medical pensions, but who knows, that’s not the important story here. A long time ago, someone walked the proximity of the temples there in Selinunte and heard a strange sound. It tore through the silence and quiet of the night and make the person’s skin crawl. They ran to the neigh-boring village and breathlessly told everyone that he had heard a long and strong breath, nothing that could have come from a human. In the nights to follow, many would also go to the temples and return with the same story. A local journalist who heard the sound would right an article the next day in “Il Giornale di Sicilia” (Sicilian newspaper) titled “The Ghost of the Warrior of Selinunte”. This journalist gave too much to the imagination about a wandering and restless spirit of a peaceless warrior killed by Carthaginians in an attack on the ancient city. Soon, it seemed, all of Sicily would be talking about this ghost. In days to follow, an expert ornithologist visited and revealed the mystery: it was a barn owl that was shouting at the stars every night. Sometimes, we Sicilians are far too imaginative. Only being 120 km from Palermo, it is possible that you could make this a day trip if you have a rented car. You should take some time to research a little before you arrive though, so you know what you are looking at. Perhaps this is more expensive, but it is worth the money that you spend. You can opt for the same organized tour I mentioned about and see Segesta in the same day. Bottom Line: Selinunte was largest, and the most inhabited of all Greek cities. Currently, there is a massive archaeological park (the biggest in Europe). If you are as intelligent as I know you are, you cannot afford to miss this stop. Olive oils and ricotta are the two best local products here. You should definitely try some sweet with ricotta like the Cassatella or the Pane Cunzatu which is a simple bread with olive oil, cheese, salt, pepper and tomato. You want to know something funny? If you visit Cefalù, you can understand that you do not need a brilliant mind like Freud to appreciate the beauty of this village, which is roughly 70 km from Palermo. Luckily, you are not going to find any Mafia stuff to talk about, at least not as blatantly as you could with Corleone. But there is a lot of history to appreciate here and things for you to do. No blood and gore, no rifles and automatic weapons, no offer you can’t refuse. Disappointed? You won’t be, that I can promise you. If you don’t trust me, trust a shrink that was very difficult to please. Cefalù reaches its peak in the summer due to crystal waters and an active nightlife that many seem to greatly appreciate. Perhaps my friend Carmelo, the best gelataio (ice cream maker) in Cefalù, was right when he said “Tano, in Cefalu, people fall in love at night.” Maybe this is some hidden secret to finding your soul mate. Who knows. The only thing that I do know is that the streets are crowded at nighttime. In the winter, the beach is not open and the nightlife dwindles, but there is still a lot of history to appreciate. Is that a disinterested look I spy? Shame on you. 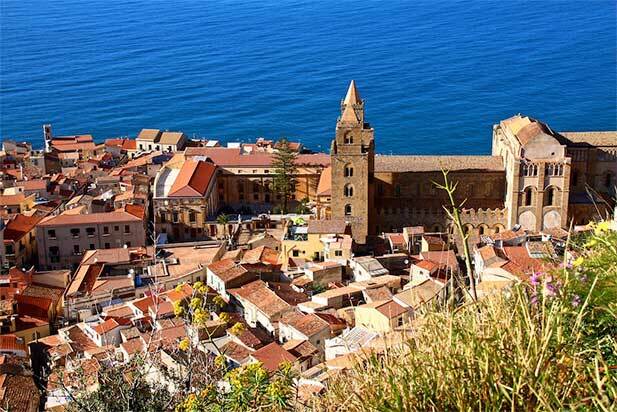 Despite your shameful behaviors, Cefalù will allow you access to one of the most praised UNESCO site in all of Sicily, the Cathedral. This town is not just a must-see for your trip to Sicily, but rather a representation of the beauty of the entire Italian nation. You will regret it forever if you do not see it in person, and no, that is not an exaggeration. Still unconvinced? Here’s something else. The town itself is on the list of the most beautiful in all of Italy. This list was created by an association looking to preserve small towns with rich history and culture as the years press on. Do you want to know something really startling? It is believed that this town was founded nearly 1000 years before the birth of Christ. It would have been ruled by the Greeks at this point in history (5th Century BC). Built by Ruggero II, who was also buried here along with his wife (though their remains are now in Palermo), this is an impressive site. Behind the cathedral, on a rock, you can find the Temple of Diana built in 5th Century B.C. Near the Cathedral, you can take a walk on the promontory. Here you can find the ruins of an old sighting tower. Imagine all of the invaders, peoples, and new cultures first seen approaching from this sighting tower. This is a must-see for the village. Here several scenes from the Academy Award winning “Cinema Paradiso” were shot. Even taking that away, the building exudes culture and history, including a 19th century canvas decorated ceiling by Rosario Spagnolo. You can easily reach this village from Palermo in about an hour with a rented car. Make sure you grab a book which lays out the main attractions here for you. There are sea and land tours of the area, dozens of them in fact. There might even be aerial tours in the works, who knows at this point. I suggest one of the 8 hour tours to Cefalu and Castelbuono (Parco delle Madonie, see below) to kill two birds with one stone. Bottom Line: While I am rarely a supporter of the touristy sites, this is worth spending a day to see all that Cefalu has to show you. You can take a swim in the crystal waters (or check out other beaches around Palermo as well) or partake in the lively nightlife. You should not be quick to dismiss the ice cream here, as it truly is some of the best you can find in all of Sicily. Listen to your old friend Tano. I am not going to tell you which ice cream shop is Carmelo’s, because he has yet to pay off a debt earned in a game of scopa cards. A man who does not pay his debts is no man at all. He doesn’t deserve you to go but Cefalu is full of gelaterie (ice cream shops). Clean air, stunning landscapes, plants, and all of the best that Mother Nature can provide. Oh no, you must just be in shock and awe, then. Whether you are an active fan of nature or not, Madonie Park is not one to miss. The Madonie Regional Natural Park is located between Palermo and Cefalu and covers about 160 square kilometers (62 miles). The park boasts six mountains that are over 1500 meters, (4900 feet) and many more that exceed 1000. The highest of all is Pizzo Carbonara at 1,979 meters (6,493 feet), which is the second largest in Sicily only trailing to Mount Etna. Besides being a nature reserve, the park includes dozens of small towns and villages, many of which date back to Medieval Times. This is around 90 km (55 miles) from Palermo. Even though it is much newer than many of the other must-sees on the list, created in 1988, it is still something you should not miss while you are here. The botanical wonder has more than 2600 species representing the whole of the island. Below I’m going to name them all one by one so that you can memorize them. Breathe! I am only joking, of course. I’m not even able to pronounce many of them. You should take in the surreal sights around you. Gaze towards Mount Etna, the Aeolian Islands and Nebrodi as the sun dances across them. You might not have the words to express it, but it will be a sight you remember the rest of your life. It is advisable to get help from a tour guide or local expert to help you navigate all that you might plan to see. It is not difficult at all to get loss in the expanse. If you plan to drive around a little, be mindful that your car might not be the best choice for mountain paths. If you drive at night, be mindful of the wildlife here (boar, deer, foxes, and more) that could run out into the road. The Madonie Park includes about 15 different villages. There is no gate with a sign letting you know that you have arrives. It depends on what kind of hiking you want to do to get to one village or another. I really do not recommend touring this on your own though, but if you do, head towards Castelbuono. As said above, you can kill two birds with one stone (not literally of course) by taking an extended tour which includes Cefalù and the park together. Bottom Line: Parco delle Madonie offers one of the best landscapes in all of Sicily as well as clean air and a blast from your past. The best part here is the food where meat lovers can taste unique dishes of boar and black pig meat. Please do not take any plants as souvenirs. Instead, do yourself a favor and try the mushrooms, boar meat (pasta with boar ragù is delightful) and the renowned black pig meat. “Vossia s’abbinirica Don Tano” scream a clumsy bread peddler named Gigi with a clear accent from Monreale to get my attention in the Ballarò Street Market while I wandered about. “Do not forget to tell tourists that my bread from Monreale is the best in the world” he said assertively. “Ciao Gigi, I will. But it’s not your bread that is the best, it is the old recipe from Monreale that makes the bread so special.” I replied. Of course, you are just wondering what the weird greeting “Vossia s’abbinirica” was. The word assabinidica was (and still is in poorer areas) a greeting for Sicilians. It is the same as saying Ciao in Italian (which is “Hello” in English). It is usually addressed to older people or those with a certain authority. Yeah, old Don Tano is well respected here. Monreale is a village of history, tradition and as Gigi pointed out, food (and no, not just excellent bread). But there is one thing that draws people in from all around the world (and it’s not Gigi). Can you guess what this attraction is? Surprisingly it is not Gigi’s bread, but the Cathedral and its mosaics. This small village is only 10 km (6 miles) from Palermo and known all over Europe for being the best location for architecture from the Arab-Norman dynasty. The Cathedral is an excellent example of this architecture. Just a little dose of the history, if you will humor me. According to stories, the Norman King William had the Virgin appear to him in a dream. He was shown where an old royal treasure trove was hidden, and that could be used to build a temple in her honor. From this discovery, William would construct the Cathedral of Monreale, which is also known as Chiesa di Maria del Flore. This structure brims with mosaics on the roof and walls. Golden mosaics here showcase iconic scenes from the Old and New Testament. I really do not have enough positive adjectives to describe the church, and it might be a literal sin for you to visit without seeing it at least once. It is one of the most beautiful churches you can find anywhere in the world. I have to tell you a secret. It is more beautiful than Palermo’s Cathedral. If you’ve got a choice and cannot see both, choose the one in Monreale. 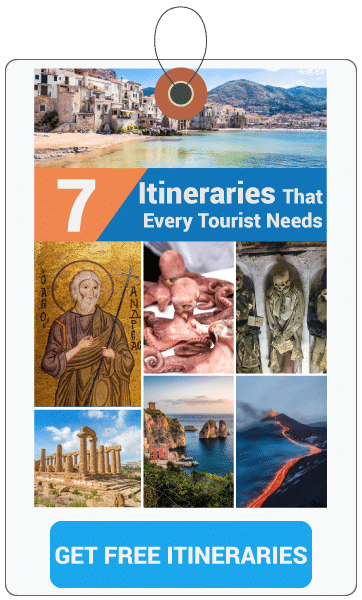 It will only take you four or five hours to drive over to Monreale, see the Cathedral and some of the other sights nearby, and return to Palermo. Well worth a rather short trip if you ask me. It is easily accessible by car or by organized tour. I recommend a nice ride on an ebike in Monreale where you will discover not only the main attractions, but you also get the chance to try some food guided by the local operator. If you are into some “traditional tour” you can check out this one (you will see also the Catacombs) that might suit your needs. 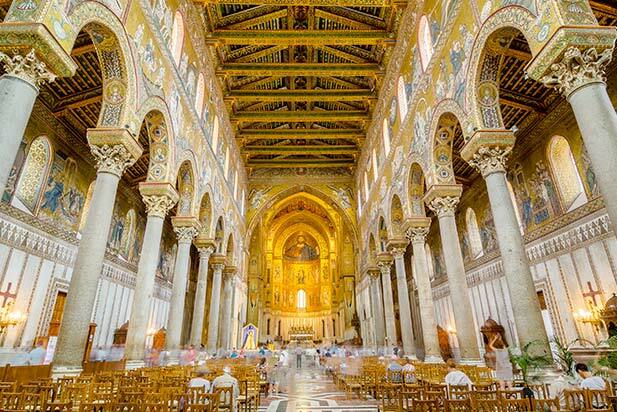 Bottom Line: Monreale is among the best attractions for Arab-Norman itinerary in Sicily and the Cathedral here demands a visit. But Gigi is right, food is amazing there and the bread is a special treat you should definitely try. One of the things to take away from Monreale is the sights of the golden mosaics, but I am sure that a nibble or two throughout your explorations will help you appreciate the area even more. This is one of my favorite places, even if it has gotten a little touristy lately. You need to look like someone who is not a naïve tourist as much as you can. Wear clothes like the locals and act as though you come to Italy regularly, especially when you are ordering at restaurants. If you appear like a uneducated tourist, you might find yourself getting charged more or getting inadequate service. One of the unfortunate flaws of Sicilians is that we believe we are smart for acting this way. It is pretty shameful if you ask me. While this town is not only high up, it is also very beautiful. The town of Erice, located on top of a mountain bearing the same name, sits about 750 meters above the see. It is a quaint little village rife with history and beauty. This is the kind of town that makes you want to throw on armor and challenge someone to swordfighting while the soundtrack to First Knight plays loudly in the background. Although, I don’t think I would look like Richard Gere. After all, old Don Tano was once a very handsome and charming young man. If you do not believe me, I will be forced to show you a photograph one day. But I digress from the days of my youth and back to Erice. You can find this about 100 km (62 miles) from Palermo, in the northwest parts of Sicily on top of a rather isolated mountain. Don’t worry, you do not need a magic carpet. You can access it easily by car, but if you want to take in some of the view, you can board a cable car departing from Trapani. Go to Funiviaerice.it for a price and departure schedule. You already know by now that when you climb a Sicilian mountain, great food is at the top. Much like Piana degli Albanesi, the food here is what makes it renowned to the locals. Don’t worry, I’m licking my lips about it too. Here, instead of the cannoli it is the Genovese. Made from a sweet shortcrust pastry, the inside is full of a sweet cream. The best that you can find is Maria Grammatico’s famous pastry shop. I do not want to go on talking about Genovese, otherwise you might go looking for that magic carpet to get to Erice right now. So let us change the subject for a moment. The views that you can witness here are breathtaking, like something you would read about in a romance novel. This is perhaps what makes the panorama so alluring, and what encourages many over the years to use this spot to propose marriage. Speaking of marriages, you will find a familiar triangular shape in the perimeter of the buildings and streets which is a nod to the cult of fertility. I’ll slap my own wrist, I can already here my grandmother calling me a sinner. Someone might think (my Grandmother especially) this is as shameful as the fountain of the same subject in Palermo. The shame being that God could bless these pieces of history. The town itself still feels like it walked out of the Middle Ages. So much that you might be tempted to don the attire of that era and speak in an Old English accent. There are still walls that exist from the times where the town needed defense from invaders, some from back in the days of the Phoenicians and others slightly more recently constructed under the Norman rule. If you rent a car, you can reach this easily in about two hours from Palermo. You can park just outside the door of the town, as you cannot enter the town with a vehicle. If you are visiting in July or August, make sure to pack armor and a broadsword to battle for parking spaces. 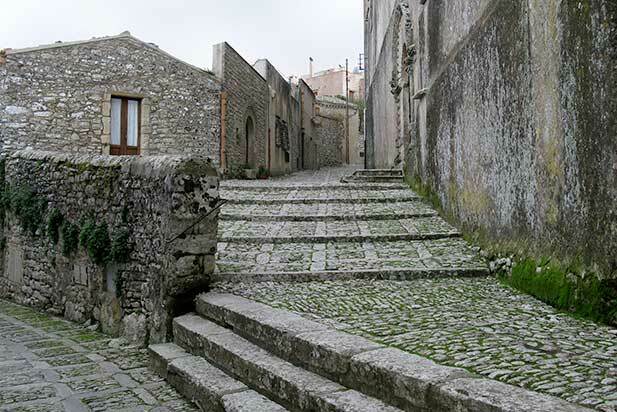 You can see Erice on different local tours. One is a combination with Segesta (mentioned above). Another one, includes these two places and adds in Marsala. A final option only shows you Erice, but you meet the guide in Trapani (getting there on your own). I put these in the order of my preference to prevent you from asking. 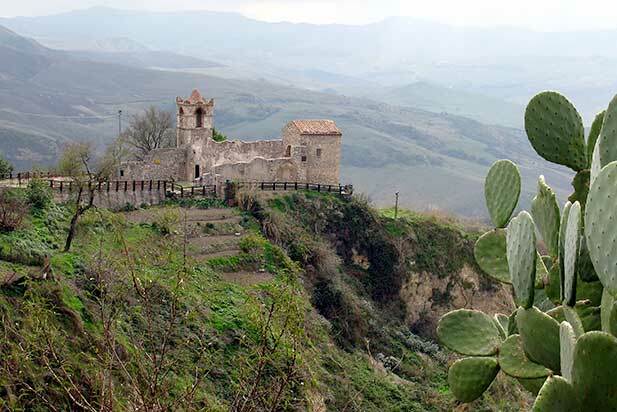 Bottom Line: Erice is an ancient town which preserves itself like few other historical locations have ever been able to. Besides the heritage, you can visit for the Genovese and other amazing treats and dishes. They are so good, you will think about them until your final days. On Erice, you will find many overpriced souvenir stores with trinkets you can buy as keepsakes. Try not to spend all of your money there, but do make sure to buy enough Genovese. You can eat them even the day after. This is Sicily’s hottest attraction, literally. The Etna volcano is one of the most amazing sites you can visit in Sicily, and stands as one of the most active in all of Europe. It all has a feel like a National Geographic documentary filming. You should not skip this sight, it is a rare thing for many people in the world to ever get to see. So make sure that you do not pass this by, because you will likely regret doing so. Yes, it could be a little dangerous to go hiking up the volcano, but well worth it. There are many times where Etna leaks lava down the mountainside, damaging farming grounds near there and even some of the structures. Seismologists work around the clock to monitor the behavior of the mountain to give visitors warnings of potential dangers, so pay attention. There is no need to risk your life to climb Etna. Many different kinds of people frequent Etna. Avid hikers wanting to see an active crater and even the winter sports enthusiast using the area to practice for various snow sports. You can drive to the top of the mountain, using the appropriate kind of car, or you can choose the cable car system as well. Of course, there is nothing stopping you from trying to climb it all on your own, but it is recommended to be in your top shape to accomplish this feat. This site is available year round, and it offers a different experience for everyone. Hiking on trails, in a variety of skill levels for example, offers outdoor fun for all. 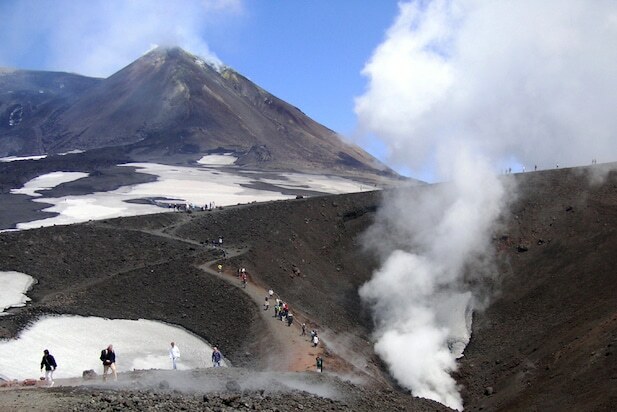 Sleeping near an active volcano might seem risky, but it is a once-in-a-lifetime experience. This area brims with nightlife, so you can forget all about the volcano and cut loose. Not advisable at all, but experienced hikers can get a jeep and accomplish this by themselves. You might find useful information to help on Etna’s official website. There are many options from Palermo where a van will pick you up at your accommodation and bring you on a day tour of the volcano. Some of these tours include a stop in Taormina as well. Bottom Line: The experience will be unforgettable but only if you know your way around. If you are not an expert or do not want to get in on an organized tour, I discourage you to go there. Sicily has a lot of marvels to see, so there is no sense doing something dangerous. This is a city for the refined mind. 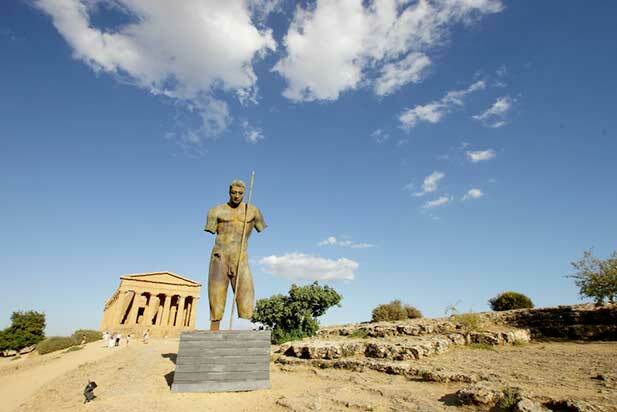 If you are in need of some more history for your upcoming trip to the Palermo area, you should make it a point to get over to Agrigento. Honestly, it is not only about the history. The city is full of bars, restaurants, churches, museums and great crystal-water beaches to enjoy. But relax, I will not lose my head for saying these aren’t the main reasons you should go. Only 100 km from Palermo, the greatest draw here is to the Valley of the Temples. Don’t know what that is? Well, shame on you. 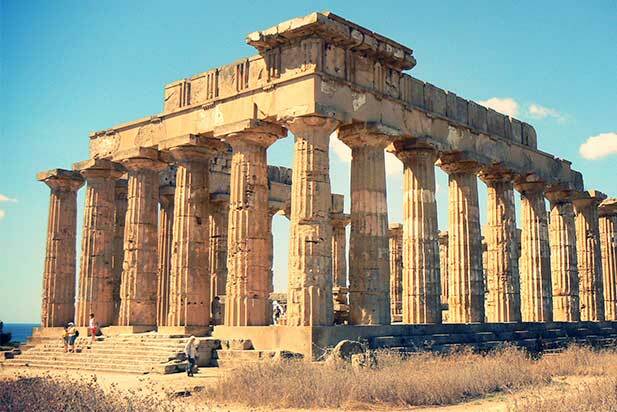 It is one of the best examples of Greater Greece art and architecture, and is one of the main attractions of Sicily. This is a national monument of Italy. It includes the remains of seven temples, all constructed in Doric style. The area was included with the UNESCO World Heritage Site list back in 1997. There are few places where art, nature and culture all interweave so seamlessly. The capital of this province, also known as Akragas in ancient times, has gotten described by the Greek poet Pindar as the most beautiful of mortal cities. On top of all of that, the city has given life to many Italian poets and scholars over the years. Agrigento is home to the Italian poet Luigi Pirandello (who has a theater and library named for him in the area, and tours include walks through his home). There are lots of attractions throughout the entire city, so just coming here for one day is likely insufficient. It might be better to get a car and accommodations for a single night here so that you have more than just one day to see all that Agrigento has to offer. Getting a car and renting an accommodation for a day might be a plausible options for those with plenty of time. For the fan of the essentials and nothing else, you can get local tours starting in Palermo which bring you to Agrigento via van, show and explain the Valley of the Temples, and return you to your accommodation. Bottom Line: This city draws in people by the herd, mainly for the Valley of the Temples. There is a lot to see and experience here, so an overnight stay is recommended. You could shorten and just see the essentials over a day trip, however, if need be. All you should bring back to Palermo is a full stomach, because there are a lot of great foods to try. They have specialties such as fish, artichokes, ricotta cheese and beans. While there are many places worth a visit around Palermo, these 10 make up the list of essentials that I would recommend to anyone. You might not be able to get to all of these, depending on the length of your stay. My hope is that throughout your visit, though, you can get to at least half of these. Make sure that you also check out the free walking tours for your time you spend in Palermo. If you happen to have any questions, concerns, or comments, drop me a line below and I will be happy to get back with you as quickly as I can.